So. 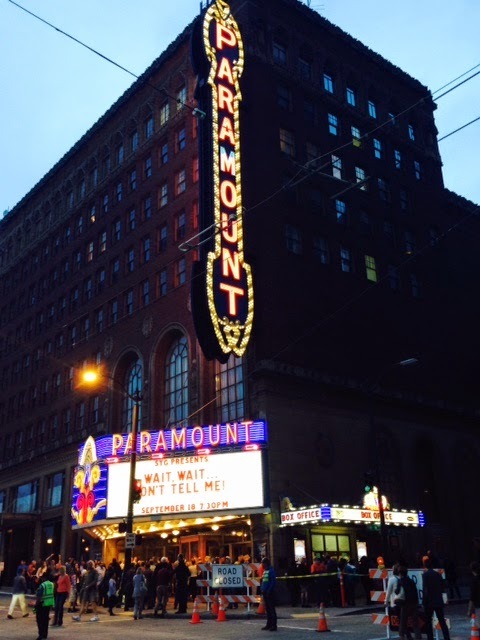 My husband wasn’t surprised when I suggested for our anniversary that we buy tickets to be in the audience when WWDTM came to Seattle’s Paramount Theater. We laughed together as panelists Maz Jobrani, Paula Poundstone and Luke Burbank joked their way through some of the week’s headlines. Their confusion about the United Kingdom is especially funny. We also cheered as native Washingtonian and travel guru Rick Steves played “Not My Job.” I’ve long appreciated Rick’s approach to travel as a way to broaden our perspectives and promote understanding of our world. That value came through in Rick’s lighthearted interview with Peter, along with his advocacy for drug reform. When I visited Rick’s website, I also learned about how his faith influences his activism, particularly related to homelessness. You can listen to the showthat aired Sept. 20. And while you’re at it, don’t forget to contribute to your local affiliate of this listener-supported broadcasting organization. It will make you smile.